Found this interesting photo online of a Belfast Cumann na mBan member, Frances Brady, on hunger strike in 1921. Brady was from Earlscourt Street in the Falls. Her father, Hugh, was a builders clerk and he and Frances’ mother, Maggie, had seven daughters and one son. She became an active republican while working in the War Office in London where she had been censoring soldiers letters home. In 1917, Michael Collins made contact with her while she was on her summer holidays in Donegal. From then, she carried out espionage for him. She also collected money for the Irish Republican Prisoners Defendants Fund (IRPDF) and carried dispatches. Brady worked under Collins in London until July 1919 when she returned to Belfast and continued her republican activism as a member of Cumann na mBan in the city, assisting in operations and carrying dispatches as well as continuing to do work for the IRPDF. The Brady house in Belfast was used as an office by GHQ and dispatches to and from Dublin routinely passed through it. From December 1920, Brady also worked with Ernest Blythe and Joe McDonagh in the Belfast Boycott (of unionists business that expelled Catholic workers). Usually she worked out of her sisters address in Lower Leeson Street in Dublin, which was often used for meetings by Collins, Richard Mulcahy and others. On the 3rd June, secret instructions* were sent from Captain Hudson in Kilmainham to raid 46 Lower Leeson Street as it was known to be used by a republican courier, Kathleen Brady (Frances’ sister who lived at the address). Hudson directed that a female searcher was to be picked up at Room 2 in City Hall and brought on the raid, while anything found was to be returned directly to Kilmainham. Frances Brady and Joe McDonagh were in the house with its other occupants – Professor, Madame Chauvire and their daughter – when a raiding party of the 2nd Battalion, Worcestershire Regiment appeared on the road outside at 7.30 pm the very same day. Lieutenants Barton and Bone and Sergeant Hurrel went straight to Brady’s top floor flat. When they burst in they found her undressed and she told them to wait a minute. Barton then sent for the female searcher to come up. When she arrived they entered and found Brady had used the time to burn papers in an otherwise empty grate. During a search of the room they found a revolver in an attaché case, binoculars, her Cumann na mBan membership card and badge, copies of An tÓglach, and, Dáil Éireann (and other) papers. McDonagh, who had remained downstairs dressed as a priest, made his excuses to the raiding party, then left the house via the back door and escaped. The military took Brady from Lower Leeson Street to their barracks then the Bridewell, which refused her entry until Barton (much to his annoyance) slowly managed to acquire the appropriate papers from the Chief of the Dublin Metropolitan Police. On 15th June Brady was tried at a general field court martial in Kilmainham. While refusing to recognise the court, she noted that it included reference to the ‘Irish Volunteers’ in the charges, pointing out that the organisation no longer existed as it had been replaced by the Irish Republican Army. She also noted that the order referred to in the charges against her wasn’t in force at the date on the documents mentioned in the same charges (the press do not record the courts response, eg see Freeman’s Journal 16th June 1921). Her sentence was promulgated and a couple of days later she was given two years hard labour and taken to Mountjoy. On the 30th October, four of the women prisoners in Mountjoy (including Eithne Coyle, Linda Kearns, Aileen Keogh and Mae Burke) used a rope ladder to escape while a football match was taking place. The authorities were acutely embarrassed by the escape and placed the remaining women prisoners under the guard of the Auxiliaries from the next day. The response of the women prisoners, including Frances Brady, was outrage. They were also equally annoyed at the escapees for not informing them of the plan (Eileen McGrane, in charge of the Cumann na mBan prisoners, had refused Coyle and the others permission to make an escape attempt). On the Tuesday (1st November), the women prisoners inside Mountjoy – Brady, Eileen McGrane, Kate Crowley, Madge Cotter and Lily Cotter – went on hunger strike in protest at being guarded by the Auxiliaries (see Freemans Journal, 10th November 1921). The hunger strike lasted until the 9th November, by which date Cumann na mBan had sent in instructions to come off the protest, presumably since the hunger strikers had not asked for permission to mount the protest from the Cumann na mBan leadership. Whether the Auxiliaries continued guarding them isn’t clear, but within weeks Frances, along with Eileen McGrane, Lily and Madge Cotter and Katie Crowley, were release from Mountjoy (on 9th December 1921). After her release, Eileen McGrane had charges brought against Eithne Coyle and Linda Kearns for escaping without seeking approval from Cumann na mBan but the charge was eventually dropped (clearly, when it comes to giving/taking orders, Cumann na mBan didn’t mess around). On her release, Frances Brady continued to work as secretary to the IRPDF in Belfast and carried dispatches from Dublin to Belfast, between the likes of Ernie O’Malley and Oscar Trainor and the Belfast IRA and Cumann na mBan leaders like Annie Ward, Pat Thornbury and Hugh Corvin. After the outbreak of the civil war, she continued in this role, along with escorting IRA volunteers and carrying arms between Dundalk and Belfast. After the 1920s she remained and married in Dublin where she died in 1977. Here is the RUC’s complete suspect list for the IRA and Cumann na mBan in Belfast in the late 1930s, including both the IRA A list and B list. The A list largely contains those who the RUC had previously arrested and held for various periods of time. Together, the combined lists contain five hundred and thirty-five names. Estimates of IRA membership in Belfast around the end of the 1930s suggest a figure of around eight hundred, with a further one hundred and twenty in Cumann na mBan. There is a good chance that some proportion of the names on the RUC list may be false names or addresses, although it is probably only a small number. Even then the RUC suspect list would still amount to half of the projected Belfast membership of the IRA and Cumann na mBan. So, did the RUC have the IRA and Cumann na mBan completely infiltrated or under such close observation that it had details of over half the membership in Belfast? Without some sort of corresponding membership lists from the IRA or Cumann na mBan, it isn’t possible to make a direct comparison to test either the accuracy of the RUC or identify the actual proportion known to the RUC. However, it is possible to carry out some tests on the quality of RUC intelligence gathering and, to some extent, get an insight into its capacity to deliver counter-insurgency measures against the (very) low intensity campaigns operated by the IRA between 1922 and 1969. There are known occasions on which detailed lists of IRA membership fell into the RUCs hands. This occurred when the RUC managed to intercept large bodies of IRA members at training camps, such as near Carnlough in 1932, at meetings in Pearse Hall in King Street, and elsewhere. The Belfast Battalion volunteers arrested at Gyles Quay in Louth in 1935 also had their details passed to the northern government. Where lists of these names were published in newspapers, around two thirds appear to have made it as far as the RUC suspects lists. Ironically, the RUC even had one simple method of collecting the names of IRA volunteers. The playing staff of the McKelvey GAA club was solely made up of IRA volunteers – joining the IRA was even a prerequisite of membership, a fact that was known to the RUC. Reports on club games, including team sheets, were regularly printed in the likes of The Irish News. Yet, again, comparison of the names of players lining out for McKelveys in the likes of 1935-36 and the suspect lists shows that the RUC did not systematically include those who were effectively advertising their IRA membership. Similarly, the list includes individuals who were no longer involved with the IRA. Davy Matthews, the former Belfast O/C was expelled from the IRA for signing a bond to get released from prison in 1934 and his name is not included. Yet George Nash, who had signed out at the same time and left the IRA, is still included on the RUC list in the late 1930s. The likes of Murt Morgan, James Pimley and the Carleton brothers had left to join Republican Congress in 1934, if not beforehand, but still are included on the list. Liam Tumilson, who also left to join Republican Congress, is not on the list (he was to die fighting with the International Brigades in Spain in February 1937). But Jim Straney, who had went to Spain to join the International Brigades (and was killed at Gandesa in August 1938) is on the list, as is Peter Fanning, who had went to Spain with O’Duffy to fight on the fascist side. The overall impression of RUC intelligence gathering appears to suggest it was fairly unsystematic and the lists were erratically maintained. The period during which the lists were considered valid isn’t completely apparent although it included annotations for individuals into the 1940s. Given that a primary tool deployed by the northern government was the detention/internment instruments of the Special Powers Act, this lack of attention to detail in intelligence gathering typically led to wide trawls in which large numbers were arrested, processed and detained for a period of time. The periodic mass arrests deployed by the northern government were intended to cast a net very widely rather than be targeted. Hence its initial round of internments in 1938 largely failed to capture the Belfast IRA’s current leadership. Instead, the RUC seemed to favour the use of informers, as was seen at Campbell College and Crown Entry. This was only effective in intercepting a small proportion of IRA operations. The map below is interactive and includes all those on the list with an address (only one, a Christopher Lee, has no assigned address). Generally, individuals are located to streets rather than trying to place them where their actual house was (most of the terraces, and often streets, in which they lived now bear no resemblance to the streetscape of the 1930s and 1940s). If you click on any individual you can see their recorded address and, if they were considered by the RUC as ‘staff officers’ on the suspect list there is an ‘x’ beside ‘staff’ in the window with the details. The full lists are also reproduced in text below the map. Here is the list of Belfast IRA and Cumann na mBan suspects kept by the RUC in the late 1930s/1940s, organised by surname (alphabetically), and then by street (alphabetically). Except for some well known figures, names and addresses are written as recorded by the RUC. This is a short history of Cumann na mBan in Belfast from the end of the civil war through to the 1960s. Obviously, anyone with information that enhances the story or adds further details is more than welcome to share it in the comments section. Jack McNally (in his 1989 autobiography, Morally Good, But Politically Bad) names those prominent in Cumann na mBan towards the end of the civil war and into the mid-1920s and later. He includes Mary Donnelly, Sally Griffen, Kitty Hennessy, Kitty Kellet, Maggie Kelly (née Magennis), May Laverty, Margaret McGrath, Sally McGurk (née Ward), Miss McKeever, Mrs McLoughlin, Mrs Muldoon, Bridie O’Farrell, Cassie O’Hara, May O’Neill (née Dempsey), Mary Rafferty, Susan Rafferty and Mrs (Annie) Ward. Annie Ward had succeeded Norah Connolly as head of the Belfast Battalion of Cumann na mBan and led the organisation through into the 1920s. Cumann na mBan in Belfast, as elsewhere, largely staffed the web that linked the various republican organisations together, collecting and moving intelligence and clandestine communications between IRA, Cumann na mBan and Fianna units and officers, assisting in moving weapons and establishing networks of dumps and safe houses. While Cumann na mBan also fundraised to support prisoner’s dependents and distributed republican newspapers, that was not the limit of its activities. The likes of May Laverty and Mary Donnelly are both known to have participated in IRA operations, such as helping move and plant explosive devices. As one of the key republican organisations Cumann na mBan attended meetings and participated in restructuring alongside the Belfast IRA and Fianna Éireann in the late 1920s. Generally, as with Fianna Éireann, Cumann na mBan was organised in two units, one covering the Falls and surrounding districts and one covering north Belfast, the Markets and Ballymacarrett. In 1926 a batch of An Phoblacht intended for Cumann na mBan was intercepted in the post. It contained 110 copies which suggests that this was the membership around this time (by the late 1930s the RUC believed membership to be around 60). By the early 1930s, May Laverty and Mary Donnelly were still prominent Cumann na mBan leaders in Belfast. Another was Cassie O’Hara, who had been engaged to Joe McKelvey and her continued support, like that of the likes of Bridie O’Farrell, maintained the Belfast unit’s sense of continuity and legitimacy. In 1933, under Eithne Ni Chumhail’s leadership, Cumann na mBan reviewed its relationship with the Second Dáil organisation (composed of those members elected to the second Dáil who maintained that it was the legitimate source of authority in Ireland). Up to then, Article 1 of the Cumann na mBan constitution required members to recognise the continued existence and authority of the Second Dáil. This limited it’s capacity to attract new members. Miss MacSwiney and two others resigned when the proposed change that only required members to “…never render allegiance to any Government but a Republican Government for all Ireland…” was passed at the convention in Dublin in June (the IRA had broken its link with the Second Dáil by 1926). At the same convention, the Cumann na mBan executive also announced the formation of Cumann na gCailíní, for girls aged 8 to 16. This facilitated an influx of new members later in the 1930s. The convention additionally agreed to embark on a campaign to propagate social reconstruction on the lines laid down by James Connolly and for an intensive campaign in the north (see Irish Press, June 14th, 1933). May Laverty was prominent in this campaign. Following the mass arrests of Belfast republicans that October (1933), Cumann na mBan again raised funds to support the dependents of those who had been imprisoned. In June 1934, Belfast contingents from the IRA, Fianna, Cumann na mBan and Cumann na gCailíní had marched in uniform in Dublin prior the annual IRA ceilí in the Mansion House. Leading Cumann na mBan figures like Eithne Ni Chumail had supported Republican Congress but returned to Cumann na mBan when Congress began attacking the IRA. In 1936, May Laverty again took a lead role in the public protests against de Valera’s government. In June, Cumann na mBan demanded entry to the meeting in St Mary’s Hall where the Anti-Partition League was founded (initially called the ‘Reunion of Ireland Organisation’). The meeting was chaired by ex-Belfast IRA O/C Hugh Corvin and while the likes of Padraig MacLogain attended, Cumann na mBan was refused entry and the IRA did not support the project. In 1937, as part of the Military Pensions Act, an ‘Old Cumann na mBan’ Association was formed in Belfast from members who had been active up to 1922. As with similar associations, it was boycotted by many who refused to endorse the Free State government. Prominent members of Cumann na mBan in Belfast in the mid to late 1930s included Una Burke, Bridie Dolan, Crissie Dolan, Bridget Hannon, Dorrie Hill, May Laverty, Violet McGowan and Maggie Nolan. A Cumann na mBan and a Cumann na gCailíni contingent had participated in the funeral procession for veteran Fenian and IRB organiser Robert Johnston (also the father of poet and author Eithne Carberry), in March 1937, in Greencastle. Dorrie Hill and Madge Nolan were present, representing Cumann na mBan, in Pearse Hall in King Street in October 1937 when a Belfast Brigade Council meeting was interrupted by the RUC and all those present had their names taken (despite the Belfast IRA staff being present the RUC thought it was a meeting of Joe McKelvey GAA club). The likes of Josephine Brady and Mary McAreavey both received significant sentences for possession of weapons or documents in the late 1930s, while Bridie Dolan was badly injured in a premature explosion. Bridie O’Hara and Mary Hewitt were both expelled from Britain during the Sabotage Campaign of 1939. Cumann na mBan was prominent in the very public demonstrations of republican strength in Belfast in the late 1930s, such as the burning of gas masks in May 1939. In September 1939, there were forty-eight members of the Belfast contingent at the Cumann na mBan conference in Dublin (Eithne Ni Chumail was still the leader at this time). The RUC believed that Cumann na mBan in Belfast was divided into two companies. Peggy Rafferty led the Belfast Cumann na mBan contingent at the infamous 1939 Bodenstown commemoration. At the time, Annie Hamill was in charge of Cumann na gCailíní in Belfast. Many of those involved in Cumann na mBan were relatives of prominent IRA members, such as Bridget Corr (sister of Arthur), Mary McLaughlin (sister of Chris) and Ellen McCurry (sister of Willie John). In October 1940, Isobel Murphy, Mary and Bridget O’Hare and Elizabeth O’Toole got two years each for distributing Cumann na mBan leaflets outside a cinema on the Crumlin Road. Cassie O’Hara was one of the first Cumann na mBan member to interned in the 1940s and was soon followed by others. Mary Donnelly, though, was killed when a German bomb destroyed her family home in Unity Street on 16th April 1941. The same night, Bridget Corr’s mother and brother were killed by another bomb at their family home in Vere Street. Prison conditions in Armagh were very bit as bad as those that the men had to endure. Those imprisoned in Armagh included Madge Burns, Nora McDowell (the only one who had children), her daughter Una, Teresa Donnelly, Bernadette Masterson, Mary McDonald, Nora McKearney, Cassie O’Hara (O/C of the Armagh prisoners) and Nancy Ward. In the autumn of 1943, the Cumann na mBan members in Armagh Jail decided to embarked on a hunger strike. You can read more about the hunger strike here, but briefly, the women joined en masse on 21st November, although by the time Therese Donnelly was given the last rites after twenty-two days it was apparent that the protest was being robbed of publicity and it was decided to call it off (it was a lesson ignored by the men who went on hunger strike the next March). The same pressures and family hardships bore down on the women as the men and inevitably some had to sign out. The last Belfast Cumann na mBan prisoners were among the eight released in July 1945 (including Cassie O’Hara), but like the IRA itself, the organisation was slow to rebuild in Belfast. Joe Cahill records that, by 1956, Bridie O’Neill was O/C of Cumann na mBan in Belfast (and apparently had been for some time). As in previous eras, Cumann na mBan looked after much of the transportation of weapons to and from dumps. In the lead up to the campaign, O’Neill had organised her units to collect and move weapons from Belfast to the border where they would be used during the campaign. Arrests during the Border Campaign also showed that Cumann na mBan continued to collect funds (officially these were for the ‘Freedom Fighters Fund’ – see Fermanagh Herald, October 18th 1958). O’Neill was the only women interned during the 1956-62 campaign (she interned for seven months). Again, as in 1945, Cumann na mBan was largely intact due to the low number of imprisonments but was slow to re-engage its membership. By the time the early 1970s, the IRA was directly admitting women as members presenting a different challenge to the rationale for Cumann na mBan to continue to exist (it largely supported Cathal Goulding in 1970 and later). Unfortunately this proclamation, probably the most important document of 1916 in Wexford, is now lost (and not just important to Wexford obviously). 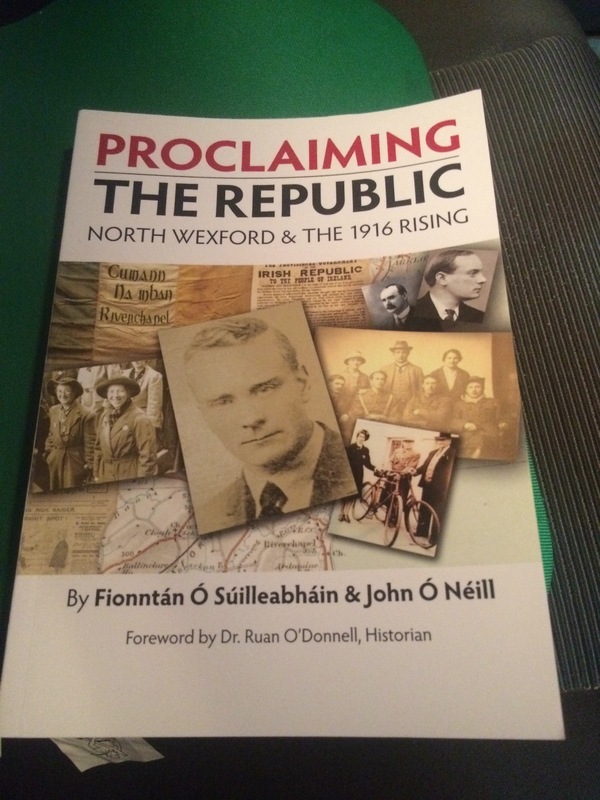 The book includes a foreword by Ruan O’Donnell. 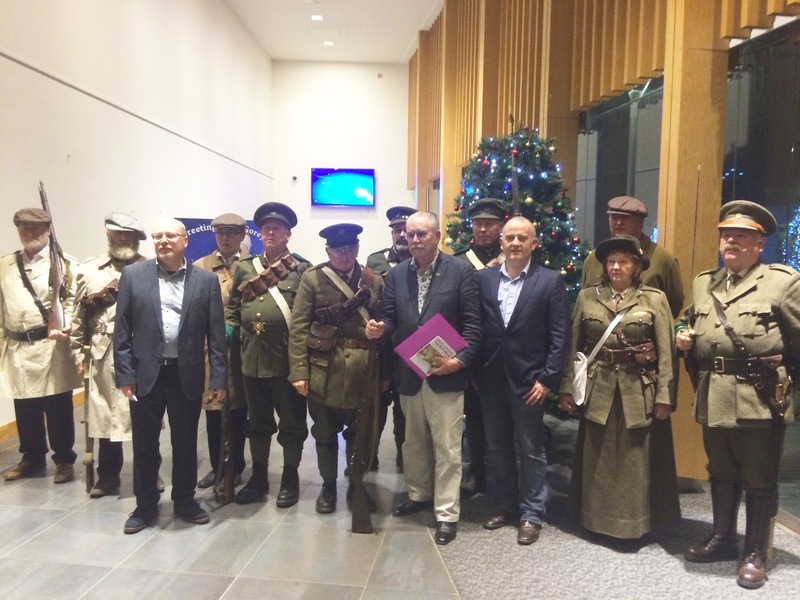 The North Wexford connections go beyond the local activity in 1916. It include the likes of Máire Deegan, Min Ryan and her sister Agnes (who left Cumann na mBan in Belfast to come down to Wexford for the Rising), James Corcoran of the Citizens Army (killed in action in St Stephen’s Green) and, of course, the Mellows family. Liam Mellows provides another Belfast connection as the city companies were to travel to Connacht to fight under him. His mother Sarah was a founding member of Cumann na mBan. The inimitable Robert Ballagh officially launched the book in Gorey library, and endorsed the book as “...once and for all, it nails the lie that The Easter Rising was simply a Dublin affair.” He was also highly critical of the current government’s commemorative plans for 2016. Production of the book was supported by Wexford county council and proceeds are going to a local mental health charity, talk.to.tom. It will mainly go on sale locally in Wexford (about 130 pages, softback, with some colour, price is around €10). I will try and get up kindle and/or PDF versions online in the near future. In the meantime, a limited number of copies can be purchased from me (send me a message via my gmail address, which is just jjconeill with the usual @ and gmail.com) including where you are – postage should be €2.50 in Ireland, €5 elsewhere). I’ll update about the kindle/pdf versions as I work it out.